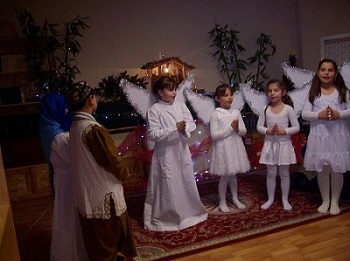 Christmas in Sekirovo included different activities for the different age groups we tend to here at Sekirovo. The elderly group Christmas recollection was held on the 20th, followed by the middle- age group on the 22nd. In- between, the parents of the First Communicants came to see their children perform a Christmas play, entitled, “Bethlehem.” Indeed, the Christmas spirit was fully deepened through these activities and was culminated by the solemn Liturgy on Christmas Eve and on Christmas Day.